Immanuel celebrates the amazing 150th milestone in 2018. While the actual date is October 5, the festivities span several months and include looking back at our history, celebrating our current ministry, and looking forward to our on-going service. A Story Wall has been created, sharing the stories of all of Immanuel’s members and friends. Generations in the church, what drew them to Immanuel, favorite things about Immanuel, and favorite memories fill the wall. You can’t help but smile when you read the stories. In July, Immanuel shared a Music Festival with the community. Five groups performed, including guitar, fiddle, piano, voice, handbells, and sing-a-long. It was fun for all—plenty of wonderful entertainment and oh-so-yummy ice cream sundaes. On Sunday, September 9 (Rally Day), the church was hopping with activity. In addition to the regular kick-off to a new Sunday School year, the children created an anniversary quilt. Simultaneously, there was a display of our Sunday School throughout 150 years. Wonderful pictures and stories of baptism, confirmation, Sunday School teachers and students, Vacation Bible School, Children’s Day, church picnics, children’s plays, Advent Workshops, and more—all available to bring back wonderful memories for young and senior members. It was a blessed source of smiles and sharing. What’s the favorite pastime of Lutherans (well okay, after singing)? Eating, of course! A potluck dinner for members, former members, family, and friends was held in September. Sharing food is one of our fortes—and there was no disappointment at this dinner either. In addition, all of Immanuel’s current ministries shared their stories of mission, membership, and activities. We gave thanks to God for his guidance in ensuring the focus of our ministries stays true to our mission to Celebrate, Grow, and Serve. Throughout the year, we have had worships including elements from former times. Pastor Joanne and the Worship Ministry pulled worship elements from former hymnals, working our way back to hymnals used in the early 20th century. For some, it was difficult to sing and read the words as they were shared up to 100 years ago. For others, it was a walk down memory lane. In both cases, it was a reminder of how much our worship words have become more inclusive. Our major Anniversary worship celebration was on Sunday, September 23 with word, music, and sacrament. The Reverend John S. Macholz, Bishop of the ELCA Upstate New York Synod preached, while the Reverend Joanne Groman-Stewart, pastor of Immanuel, presided. Immanuel’s Director of Music Amanda Mole, the Adult Choir, ImmanuBells, and additional musicians filled the sanctuary with their gift of music. Immanuel will dedicate our on-going ministry at worship on Sunday, October 7. Our last formal event of the year, this service calls for God’s blessing of our thoughts, plans, and actions as we continue to serve Him in our local Webster community and throughout the world. What a great way to remember our 150th anniversary for years to come! This “sill sitter” image of Immanuel is labeled on the back with our 150th anniversary. It can be purchased for $15. Place it on a shelf or over a window. A great gift for members, former members, family, and friends. 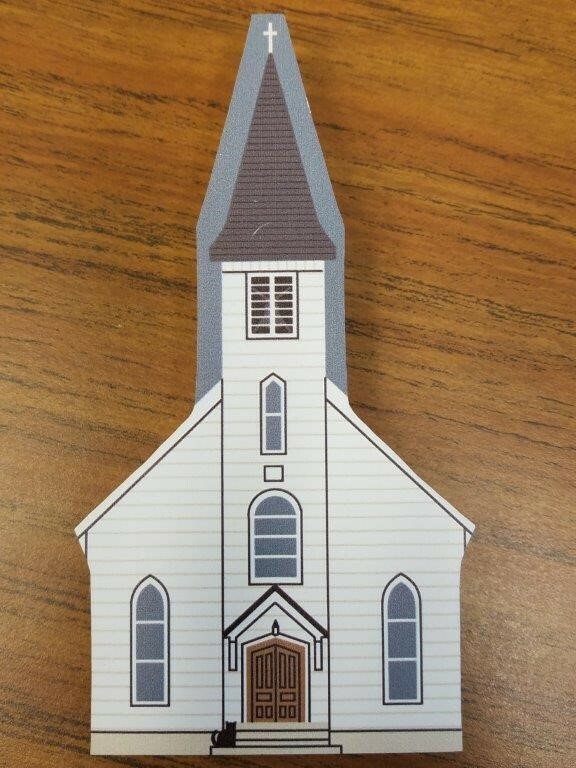 This souvenir will be available for purchase at all special events, as well as on some Sunday mornings.